Home » Cocktails » Drinks » Entertaining » Fusion Dishes » Recipes » Bright and beautiful sparklers for New Year’s Eve – Rainbow Cocktails! Bright and beautiful sparklers for New Year’s Eve – Rainbow Cocktails! 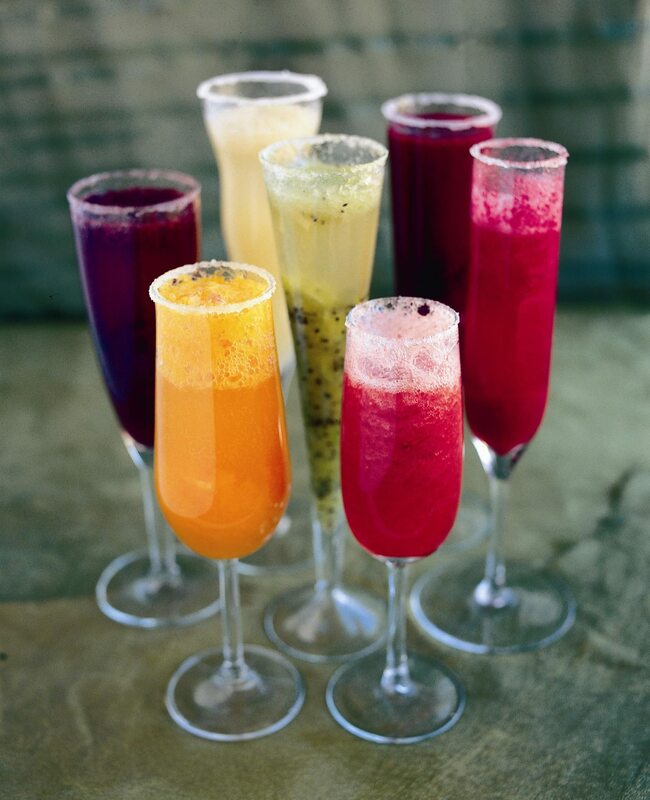 If you are hosting a New Year’s Eve party, these glasses of colourful fizz always impress. With the snowy sugar or salt-frosted glasses lined up on a table or counter, a third or half-filled with the fresh fruit purée in rainbow hue order, they are beautifully decorative, ready to be topped with Champagne, Prosecco, Cava or a non-alcoholic spritzer as you wish. They couldn’t be simpler. All you need is a blender. The purées can also be made in advance and stored in containers in the fridge, then simply use a jug to pour into the glasses when you are ready. Remember, the way you spend New Year’s Eve is the way you’ll spend the rest of the year…so spend it in style! Go to town with whatever colours you fancy or suit your theme. For a rainbow effect, think red berries, clementines, pineapples, kiwis, green grapes, blueberries and blackberries to cover the spectrum. Just make sure that when you blend the fruit you do so with some water (keep adding little by little) to ensure a smooth liquid and also strain before pouring into your glasses (or containers if making in advance). This will ensure it combines well with the fizz, rather than collecting and clumping at the bottom of the glass. A basic syrup can be made by heating 150g golden caster sugar in a pan with 300ml water over a low heat, stirring occasionally to help the sugar dissolve. When dissolved, turn up the heat and boil for 5 minutes without stirring. Switch off the heat, allow to cool slightly for a minute before adding your flavourings such as fruits, herbs and spices. Let it sit and infuse with colour and flavour for 30 minutes before straining and chilling, ready to use as your base for the cocktails. I particularly like to use a basil syrup with champagne. Have 1/2 cup lemon juice to-hand and pour enough of it onto a large plate to cover the surface. Do the same on another plate with white sugar or salt, as you prefer. If you are going to town with your party, you can also add some edible glitter, gold or silver leaf. Take each of your champagne glasses and firmly and cleanly dip the rims into the lemon juice and then straight into the sugar or salt. I find slightly twisting the rim in it ensures a clean edge. When you are ready, fill each glass with bubbles, using a swizzle stick to combine. Then learn from yesterday, live for today, hope for tomorrow, and paaarty! ← Happy Holidays from my kitchen to yours! Vicky I love the site and all the beautiful photos on it. Beautifully executed. Its been a long week! I think tonight I will make a couple of these lovely Rainbow Cocktails! They look and sound awesome.